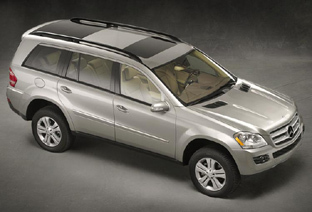 The Mercedes-Benz GL450 is a full-size SUV introduced in 2007. It is a large yet refined vehicle which is based not on the rugged G-Glass' body-on-frame chassis, but on an elongated and widened version of the M-Class's unibody architecture. Standard features of the Mercedes-Benz GL450 include dual-zone climate control, interior air filter, tilt/telescopic premium leather-wrapped steering wheel with radio controls, cruise control, heated 8-way power front seats, 6-disc CD changer, outside-temperature indicator, and universal garage door opener. The GL450 is powered by a 335 horsepower V8. The second generation Mercedes-Benz GL-Class appeared in 2012.